I'm ecstatic to care for your families' dental needs in Evergreen Park, Oak Lawn, and other communities. 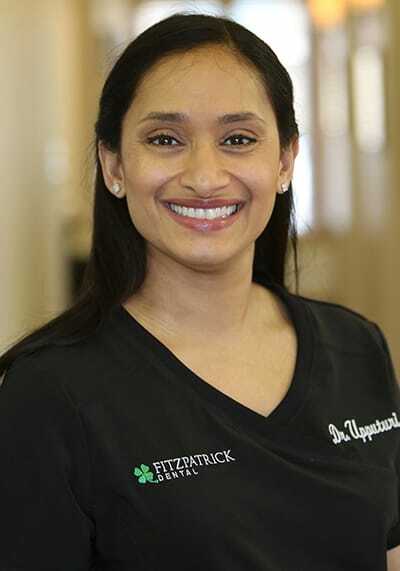 ‘‘I'm thrilled to be part of the Fitzpatrick Dental team! As your Evergreen Park area dentist, I promise to provide you with the best dentistry available, so your smile and health are always at optimal levels. Please let me know your fears and desires and we can work together to make your appointment an enjoyable experience. Completed her undergraduate studies in Cincinnati, Ohio at the University of Cincinnati. A graduate of The Ohio State University College of Dentistry in Columbus, Ohio in 2001. Completed 12 months of advanced education in General Dentistry at Columbia University College of Dental Medicine after dental school. Married to her husband Aaron and together they have three beautiful children Aryana, Kavin, and Keerthan. Enjoys spending time with her family, traveling, dining, and yoga. How Can Dr. Upputuri Help You? Experience what everyone is smiling about!